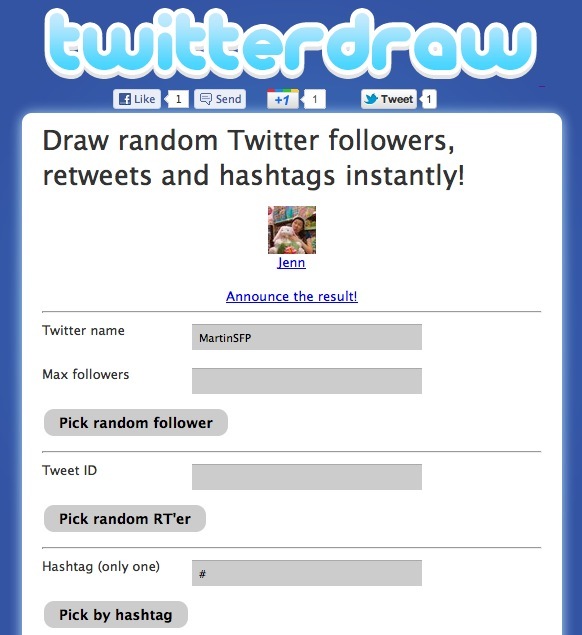 If you look after a business account on Twitter, there may be times when you want to run prize draws. These often follow a ‘retweet to win’, ‘follow us to win’ or ‘use this hashtag to win’ format. In these cases, you want a quick and easy way to choose a winner at random. Sure, you could just pick someone yourself – but there’s always that niggling doubt that it’s not really random – and it can be a pain to do, too. Twitterdraw is a simple Web app that allows you to do three things – pick a follower at random from any account; pick someone who has retweeted any tweet by entering its unique ID number, and pick someone who has used a particular hashtag. Fill in the form, click the button and you have your winner – simple. No poring over Twitter search results or follower lists, worrying that you picked that winner because you subconsciously fancy them or they’re your friend’s window cleaner – the Web app does it and you’re sorted. Twitterdraw comes from London-based Iain Haywood. It’s a surprisingly sensible app, given that the last time we covered him he was making a soap opera starring lumps of rock. He also runs Competition Hunter (a ‘Reddit for competitions’) and The Competition Agency, so this is related to those endeavours. This new service may fall foul of Twitter’s app-naming policies (it’s not keen on official-sounding third-party projects), but social media marketing bods around the world are probably bookmarking it right about now, ready for their next prize draw.